Digital options are a financial instrument that can be traded exclusively at IQ Option. Since the broker was criticized for its limited portfolio, it decided to create new products to attract new traders. Some of these new products are forex options, cryptocurrencies, and digital options, to mention a few. Conclusion – Should You Trade Digital Options? Digital options combine the elements of classic options, on-touch options, and binary options. The result is an exciting product, which new as well as seasoned traders cannot resist. It enables trading on a wide range of financial instruments. Traders can set a strike price manually, a fact that considerably brings the trade’s risks and potential profits under their control. Unlike binary options, where the trade profitability is determined in advance, digital options deliver a higher potential for earning. Traders can actually vary their potential profit amount by making adjustments to the strike price. Traders can minimize their risks by taking the strike price as close to the present price as possible. They also have the freedom of increasing their risks by taking the strike price away from the actual price in hopes of earning higher profits. These are short-term trades, the expiry time of which ranges from one to five minutes. But traders have the freedom of exiting their trade even before it expires and thus minimize their losses and lock in their profits. Moreover, digital options trading can be done in just a few simple clicks at IQ Option. They are based on currency pairs. While the loss can go up to 100%, the profits can be as much as 900%. Digital options expire in up to five minutes. So traders can enter a trade up to its last 30 seconds. Digital options trading is available round the clock, closing only from 19:30 to 22:30 UTC. Traders can open a number of operations till the final 30 seconds of the life of the trade. They exit the trade even before its expiry time. The potential profit varies according to the strike price. Traders have to push the strike price away from the actual price to increase the potential profit, but they should remember that they will also be increasing the risk. Choose the expiry time frame. Select the amount you would like to invest on the trade. Click on Call if you feel that the price will rise. Click on Put if you feel that the price will fall. If you feel that the trade is not going in your favor, exit to cut your losses. Exciting Financial Instruments – Since these are short-term trades that move at a rapid pace, trading digital options is exciting, adventurous, and fun. High Potential Profit – Traders can make profits of up to 900% while the maximum loss is just the amount invested. Early Exit – If traders feel that an early exit will fetch more profit, they can exit even before the trade expires. Enter Multiple Trades – If traders can handle it, they can open multiple trades in the same option irrespective of whether they choose to Put or Call. Easy to Learn – Even beginners can easily learn how to trade digital options. Enter Multiple Trades – This is an advantage only if you are a seasoned trader who can manage several trades at the same time. It becomes an advantage when traders try to open multiple trades in order to make up for the amount they lost. If traders lose control, they can lose a lot of money. 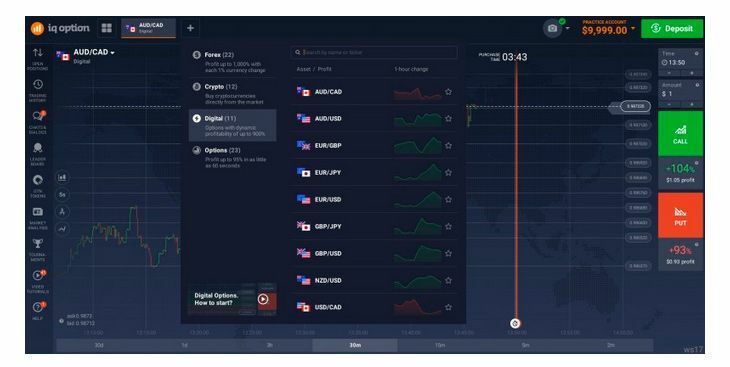 Short Term – While digital options trading comes with the potential to profit up to 900% in the shortest possible time (30 seconds to five minutes), it also comes with the risk of losing the amount invested in the shortest possible time. Addictive – You can easily get addicted to digital options trading if you are not careful. And if this happens, your account could get wiped out in no time. IQ Option describes digital options as a trading instrument that challenges clients to predict the extent to which the price can change, instead of predicting price movement. Digital options trades have expiry time frames ranging from 60 seconds to 5 minutes. Traders can invest as little as $1 per trade, but the profit potential is up to 900%. There are no broker fees. In binary options trading, traders get fixed returns for making correct predictions on the price movement of a given asset within a given time frame. The profit potential is up to 95%. In case of a wrong prediction, traders will lose the amount they had invested in the trade. Binary options trading is available on assets such as currency pairs, commodities, and stocks. Traders can invest a minimum of $1 and earn profits of up to 95%. The expiry time frames range from 60 seconds to the end of the month. There are no broker fees to worry about. You must certainly trade digital options if you have understood the risks associated with such type of trading. And even if you are an expert trader, you must implement some effective risk management strategies. For example, some traders feel that investing over 3 percent of their capital on one trade is fraught with too many risks. If you are still in the learning stage, we suggest opening a demo account at IQ Option. This allows you to learn more about digital options trading without risking your own money. When you feel that you have learned enough, you can start trading for real.